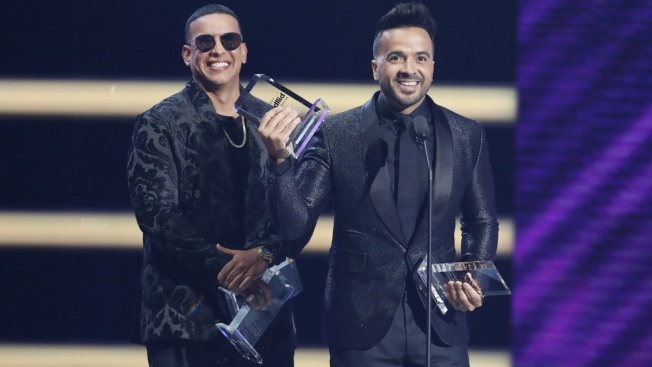 Daddy Yankee, left, and Luis Fonsi accept the award for hot Latin song of the year for "Despacito" at the Billboard Latin Music Awards at the Mandalay Bay Events Center in Las Vegas on Apr. 26, 2018. It was a “Despacito” night in Las Vegas, where Daddy Yankee, Luis Fonsi and Justin Bieber’s hit song became the biggest winner of the Latin Music Billboard Awards. “Despacito,” which became a global phenomenon since it had its live debut during last year’s ceremony, granted the musical trio six awards including Hot Latin Song of the Year, Hot Latin Song Vocal Collaboration, and Digital Song of the Year, among others. Telemundo broadcast the Latin Music Billboard Awards’ 20th anniversary Thursday night live from the Mandalay Bay Events Center in Las Vegas. At an individual level, Daddy Yankee was the most-awarded artist. The urban artist took home Latin Rhythm Artist of the Year, and Solo Artist and Composer of the Year, adding up a total of eight awards. Fonsi and Bieber received seven awards each. The Puerto Rican singer added Artist of the Year in the Hot Latin Songs category to his “Despacito” wins, while the Canadian singer was named Crossover Artist of the Year. Urban rhythms and reggaeton artists grabbed the spotlight. Ozuna, who earned the Best Artist of the Year title, took the stage with Cardi B to perform “La Modelo” for the first time on live television. Also for the first time live, Nicky Jam, who won Latin Rhythm Album of the Year for “Fenix,” performed “Equis” featuring J Balvin. Regional Mexican music was notably absent from most categories. However, Mexican artist and New Artist winner Christian Nodal dominated the genre this year with three awards, also including regional Mexican Artist of the Year, Solo, and regional Mexican Song of the Year. Mexican rock band Maná was honored with the Lifetime Achievement Award for “their career achievements and philanthropic contribution.” Maná thanked Carlos Santana, who presented the four members with their trophy, for serving as an inspiration to the band’s members since its foundation in 1985. Shakira walked away with five trophies, making her the most awarded female artist of the night.